I’m assuming you weren’t the lucky winner of Michigan’s $337 million Powerball this week, so I’m guessing you’d be interested in making a little extra cash. Thankfully, the Gambling Gods have released the complete list of investment options for tonight’s “Strikeforce: Rousey vs. Kaufman” event to help fill your pocketbook. Ronda Rousey (Pictured) remains a significant favorite to retain her bantamweight crown against Sarah Kaufman. 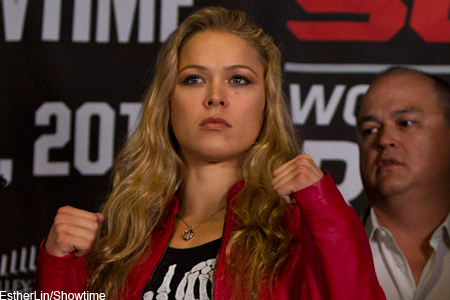 The “Rowdy” one is a whopping 7-to-1 odds-on favorite to cruise through her first title defense. Kaufman, meanwhile, checks in as a 4.5-to-1 longshot to hand Rousey her first professional blemish. The lines aren’t much better in the show’s co-featured fight. Ronaldo “Jacare” Souza is a 6-to-1 favorite to dispose of middleweight Derek Brunson. Brunson is pegged as a 4-to-1 underdog. Valley View Casino Center in San Diego, California hosts tonight’s festivities.